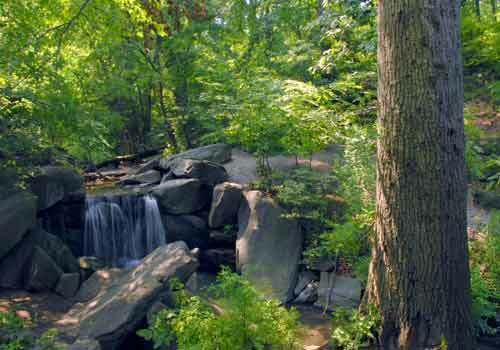 Perhaps the most secluded and peaceful area of Central Park, the North Woods (located at Central Park's northwest corner) offers a taste of the Adirondack Mountains just a few subway stops away from Times Square. The North Woods is one of the Park's three woodlands (along with the Ramble and Hallett Nature Sanctuary), offering people and wildlife an oasis of nature in the middle of New York City. The heart of the North Woods is the Ravine. Fallen trees, or snags, are left where they land (unless hazardous or obscuring paths), providing nutrients to surrounding plants, homes to wildlife and a natural look to the landscape. Once entering through the magnificent rustic Glen Span Arch at the eastern edge of the Pool (between 100th and 103rd Streets), Park visitors are treated to a view of the Loch, a stream rebuilt by the Conservancy in the 1990s. The North Woods is a favorite spot of birdwatchers and hikers. Free guided tours are available regularly. You can learn more about the North Woods, and the Park's other woodlands (the Ramble and the Hallett Nature Sanctuary), through one of our Woodland Discovery Programs. West Side to Mid-Park from 101st - 110th Streets.